While we were disappointed that the Council’s ruling party ignored our concerns with the new contract and in December voted the changes through, we have tried to work productively with officers since then. 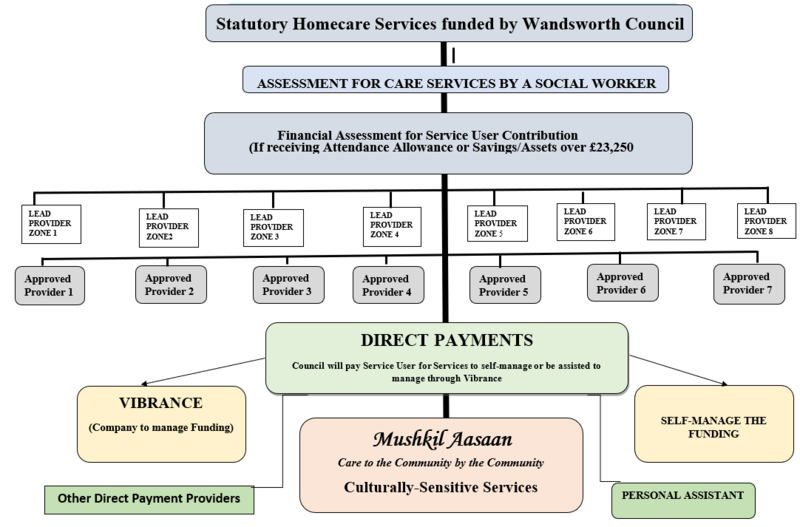 The Director of Social Services committed to us that our existing home care service users would be supported to consider moving to ‘Direct Payments’ so that they could continue receiving care from Mushkil Aasaan if they wished. We were reassured that we would not be financially disadvantaged by having to accept Direct Payments instead of a contract, so that we can keep offering a high quality service to clients and provide all the additional voluntary services that are so important to our Community. We also discussed how we will attract service users in future as there is a risk that over time our client base will dwindle. This would make it hard to keep our workers in employment and keep providing our full range of services. This remains unresolved and a huge concern. We ask all our supporters to spread the word that Mushkil Aasaan is still here and still ready to serve the Community. We feel very let down by how the Council has communicated the new arrangements, via a lengthy and confusing letter to Service Users. This does not mention Mushkil Aasaan at all and has left many believing that they have to transfer their care to the new provider. We are trying to reassure people that if they want to stay with Mushkil Aasaan they can do so via Direct Payments. We need the Council to make this clearer and support people in transferring as they promised us they would do. We remain grateful for the support of our friends across the Community.